This unofficial kickoff to football season gives fans a chance to hang out with people they listen to on the radio. Eytan Shander started out as one of us. 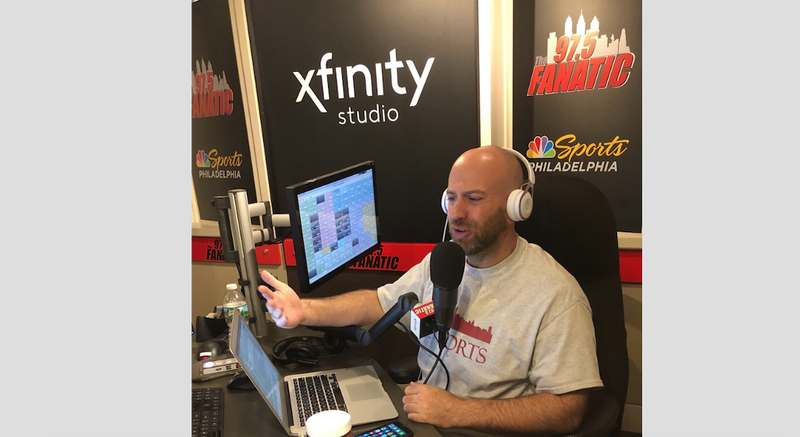 Shander, who hosts shows on the Fanatic, is now on the radio at all times. If Mike Missanelli is out, Shander takes over his show during the afternoon. If Anthony Gargano is on vacation, Shander calls the shots on the morning show. He also hosts an extremely popular show on weekends. Now, he’s the guy running the show on the popular sports talk station, but growing up, Shander was one of the guys in the 700 level at Veterans Stadium cheering on his Eagles. Now he’s one of the most trusted and popular voices in Philly sports radio, but Shander certainly worked his way into this position. After graduating with a philosophy degree from Gettysburg College, he went on to study at the Connecticut School of Broadcasting. Ever since graduating there in 2004, he’s been working in radio. But it wasn’t always the glamorous life of talking sports with Philly sports fans. He did whatever it took to get his foot in the door. “I worked at a small station in Atlantic City and got to learn so much there,” Shander said. “Not all on the air, I was doing everything they needed. He also took a job in Princeton at an ESPN Radio affiliate, and then he headed to Nashville, which is where he got his first break in a big market radio station. Then he came back home to Philly with WIP. He would mostly work as a producer and an update guy, but eventually got an overnight shift. “I was very lucky because in my career,” Shander said. “I had two legends help me, Angelo Cataldi and Michael Smerconish. Both helped me. They would encourage me and give me advice. On Aug. 25, Shander will have some help celebrating some of the greatest days in Philly sports when he and the rest of the hosts from his station attend Fanfest, the day that the Fanatic takes over Xfinity Live for an all-day party celebrating all things Philadelphia. It’s an unofficial kickoff to football season, and gives fans a chance to hang out with people they listen to on the radio every day. “It’s a great day, I’ll be hanging at the bar, buying drinks for people,” Shander said. “We’re giving away a trip to London for the Eagles game and Ben Simmons will be there, hanging out for a little bit. There’s bands there, we rent out Xfinity Live and it’s our chance to say thank you to all the people who listen. Another thing that makes Shander’s job fun is the Philly sports team. Right now, Philadelphia riding a hot streak. The Flyers are competitive, the Phillies and Sixers look like they’re starting to head to the top of their sports after long rebuilds and the Eagles are the world champs. It might never get better. Fan Fest will be one day for the fans to get together and talk sports. But Shander will be doing that for the foreseeable future. He’s still focused on doing his best at the Fanatic. He’s also now doing a segment on Fox 29’s Good Day Philadelphia and does some work for SB Nation, a national sports website that hosts blogs and podcasts. He’s come a long way from when he’s started, but he’s still doing his best to pick up tricks of the trade. He wants to continue to do what he loves most — discuss sports and pop culture in the place he loves. “I want to keep getting better,” Shander said. “I will watch other guys. I won’t do what they do, or use their bits, but I’ll learn another way to talk to someone. You have to keep learning. “You have to run a show that people like. Sometimes when we’re not talking sports, we’ll talk about TV shows, so you have to stay up and watch TV or Netflix. Especially when you’re doing it for your fellow Eagle fans.